went to see Dr. Lee Dowdy (a relative of Daddy’s) and discovered that I was pregnant. Mama had planned to come from Tennessee to help when the baby was born but Papa got sick and she couldn’t come. I thought the baby was due September 15th and on August 28th Comer and his father-in-law, Mr. Shubert, came and got us so I could have the baby in Tennessee. We got to Mama’s house on Sunday evening but went right over to Buford’s and Vollie’s to spend the night. I had Diarrhea all night! Ha! I couldn’t sleep and Daddy read “Gone With the Wind” to me. About five o’clock I woke Vollie up and told her that we were going to my Mama’s house. She took one look at me and yelled for Buford to go get the Doctor and for Daddy to go get Mama and Mrs. Shubert. 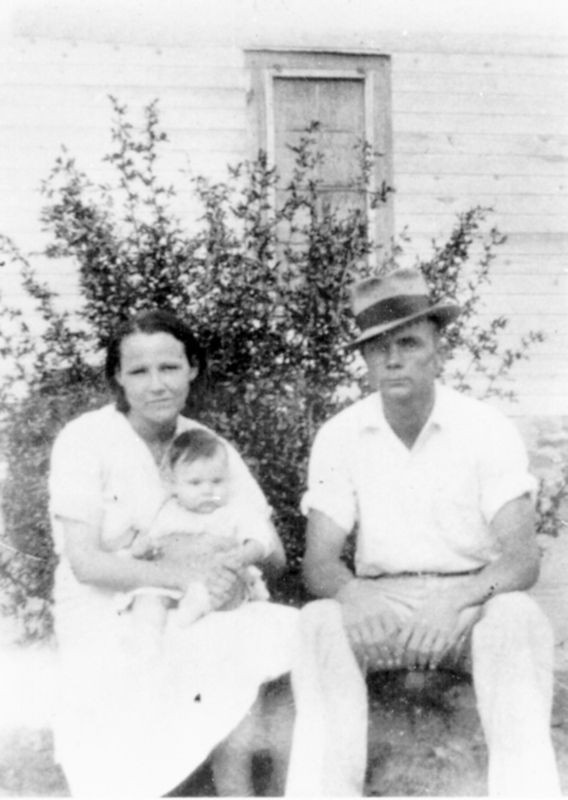 Dr. Griffin, from Elora, got there about 5:30 and Virginia Belle was born about 6:30, August 29, 1933 in Flintville, Lincoln County, Tennessee. Having a baby back then was a lot different from having one now. Back then you didn’t even sit up in bed for nine days. Then you could hang your feet off the bed and later in the day you could walk if someone helped you. You didn’t even pick up the baby for three weeks: someone would hand it to you. So Vollie took care of me for nine days. Thank you, Sister. I guess I’d better tell about Vollie. Buford was a very handsome young man. All the girls were crazy about him. But I can’t remember him looking at, much less dating, anyone but Vollie Pitts. She was the baby of her family and a very beautiful blond. They lived sort of in another community so we didn’t know them very well. In fact, I don’t know where or how he met her. But from the day he met Vollie there was only one woman in Buford’s life. I’m sure that Buford still sees Vollie as the young girl she was when they met when he was eighteen years old. You would think that since she was the baby of the family that she would be petted and lazy. But I’ve never known a harder working woman in my life. It was about one o’clock when we got to Vollie’s house. Vollie and some of her daughters had picked a couple of wash-tubs full of wild blackberries that morning. When we got there Vollie and two or three of the girls were in the kitchen. They had already washed the blackberries and were canning them and making jelly. Addie B. was almost full term with one of her babies. She had killed twenty chickens, dressed them and was putting them in the freezer. She had blood on her clothes and feet. Vollie had one of the boys shoot ten guineas (a kind of fowl) and she was canning those. They had two ironing boards up. Hot as hell in there! On the back porch they had cucumbers that they were washing to put in lime for pickles. We went to the yard where they had tables and chairs. There were two wash-tubs full of green beans on the table and pans sitting around on the tables and chairs. While Vollie sat there and visited, she broke beans! How did you do it, Vollie? Every summer, Vollie managed to get a sore foot. She got married with one shoe on. I didn’t go to their fiftieth wedding anniversary, but somebody told me that she could wear only one shoe. What about the sixtieth anniversary? A sore foot again? Buford, I wrote that for you because I think you put the writing of it off too long! It’s good family history. Little things are what lives are made of. Maybe years from now one of your great-great-grand-daughters will wonder what Grandma Vollie was like and read what a worker she was. She picked peoples’ scrap cotton—very few scattered burrs that the owners wouldn’t fool with. That was part of her Christmas money. But I’m not ready to write about other peoples’ lives. I haven’t finished with my own yet! When Virginia was a month old we went back to Alabama. A few months later in February, 1934 we moved into another house and became share-croppers. Virginia walked and talked early. Her first words were, “Daddy see! I walk!” I was pregnant again and Daddy took me to Tennessee in October of that year and he went back to Alabama to take care of the farm. Dorothy Ruth (Dot) was born at Mama’s house on November 1, 1934. She had black hair and was about the ugliest baby that I had ever seen, but by the time she was two months old she was beautiful. Dr. Shelton from Kelso delivered her. The fee for both of those deliveries was $5.00 each. When Daddy took us to Tennessee that time we were all sitting around on the front porch and in the yard and the men started talking about mules. Comer said he had traded for a mule that didn’t have a lick of sense. He said he couldn’t even let him out of the stable, he was so mean. Daddy said he could ride him. 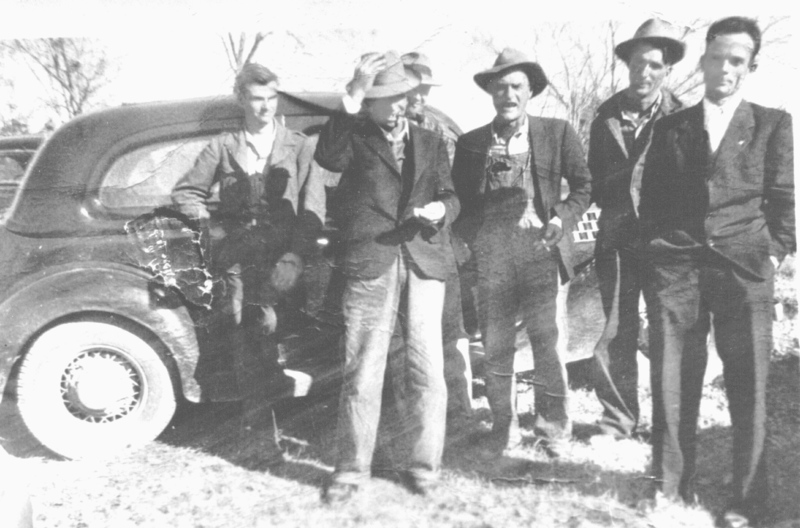 Comer, Buford, and Riley told him that he was crazy, nobody could ride that mule. Daddy said there was not a mule anywhere that he couldn’t ride. Another time Daddy and I were visiting and Mama asked Daddy if he’d take Ted out in the woods and shoot him. Ted was a collie that Papa had bought for Dora and Nora when they were babies. He would have died for them. Maybe Evelyn pulled his tail (for she was only a baby herself) because he never liked her. He never bothered her, but when we were older, I would sic him on her. He never hurt her but he would stop her. Daddy still didn’t want to do it but he said he’d do it if I went with him. Ted followed us to the woods. Daddy raised the gun, sighted, shut his eyes, and fired. We looked to be sure that he was dead and went back to the house. In about an hour the girls came from school. The first thing Dora said was, “Where’s Ted?” Mama told her and I went with Dora and Nora to see and then we buried him. When we went back to Alabama after Dot was born, we moved in with Grandma Veal. She lived in one side of the house and we lived in the other side. Virginia loved flowers (“booms”), milk fresh from the cow, “her Daddy”, and “that ole baby” in that order. Of-course her first love was rocking. We had to rock the cradle all night. Her Daddy could rock it in his sleep. Dot learned to walk and talk early, too. She loved books and climbing. She was forever climbing on something. We moved from Grandma Veal’s to Arlie Cobb’s house. Daddy’s dream was to have an egg farm, a dozen kids, and live a useful meaningful life. 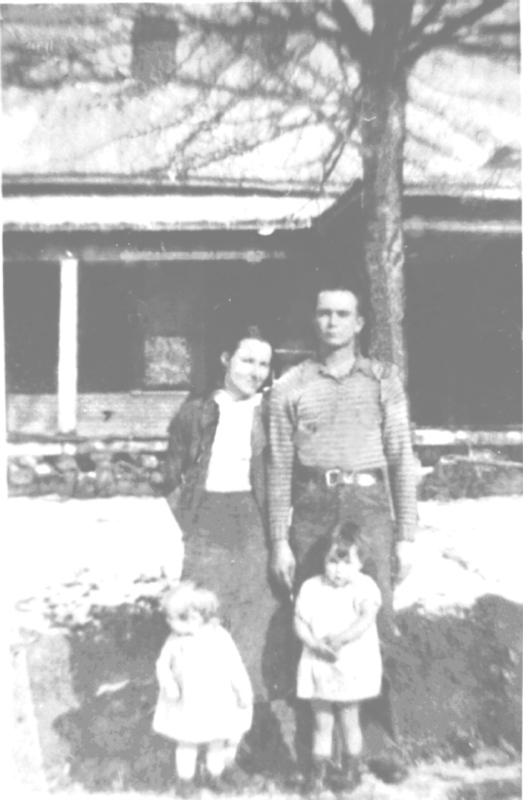 When Dot was a baby, he heard that the government had a project on Cumberland Mountain where you could homestead forty acres of land. After you had been on the property for two years, the government would help you build a house and would furnish fruit trees, seed, and etc. And after five years you would get the deed to the property. The government had built a community center and had people to show you how to go about homesteading the land. Cumberland Mountain was about fifty miles from where we lived and Daddy decided to go and check it out. He walked and was gone for ten days. When he got back he said that was not for him. He had thought that we were at the bottom of the barrel, But the people that he had stayed with on Cumberland Mountain, qualifying for their two years to get into the program, were below the bottom of the barrel! I guess that project never got off the ground. Four or five years ago Vernon carried me to Flintville from Rainsville and we went by the old community center. That area is still wild. Vernon said that he had built a few Jim Walter houses around there but that was about all.